In garments washing plant, a lot of machines are used for different purposes. Where, some machines are used in dry process and rests of those are used in wet process of garments washing plant. Different types of machines used in garment washing plant are discussed in this article with these functions. In garments washing plant, sample washing machine is an important equipment. All the sample garments are washed here. Sample washing machine is must for any garments washing plant. Side loading washing machine is used for washing bulk garments. In latest garments washing plant, front loading washing machine is a common machine. 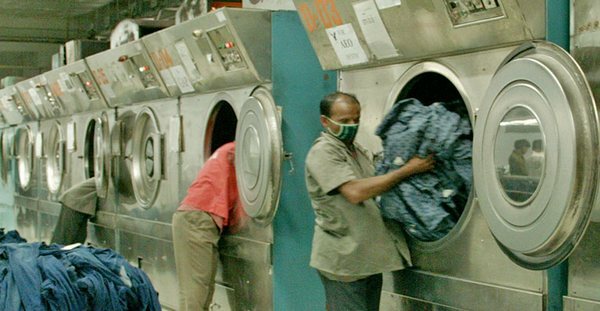 It is also used for washing bulk garments. It has so much advantage than side loading machine. This type of machine is used for extracting excess water from the garments. Steam dryer is one kinds of dryer which is run with the help of steam. If the garments shade will needed in blue tone then steam dryer will be used. Gas dryer is also one kinds of dryer which is run with the help of gas. If the garments shade will needed in reddish tone then gas dryer will be used. Chemical mixing machine is needed in mixing the chemical. It’s an important equipment in garments washing plant. Industrial woven is used for curing 3D garments. This type of machine is run with the help of gas. This kind of woven machine is run with the help of electricity. This type of machine also used for curing 3D garments. For completing 3D process properly, Industrial woven is must in garment washing plant. Boiler is an important equipment in garments washing plant. Boiler is needed for producing steam. Submersible pump plays an important role to provide necessary water in all the wet process of garments washing plant. It is must for running any garments washing plant. Grinding machine is used in dry process of garments washing plant. It has so much importance in producing grinding effect on the garments. Tagging machine is also used in dry process of garments washing plant. For creating tag effect in garments, it has so much importance. This type of machine is needed for crinkle process of garment washing plant. E.T.P plays an important role in receiving an order from the buyer. E.T.P plan is must for 100% export oriented garments washing factory. For producing electricity, generator is an important equipment in garment washing plant. Sand blasting gun is used in dry process of garment washing plant. During sand blasting it’s needed. Sand blasting chamber is also used in dry process of garments washing plant. It’s a crying needed in sand blasting process. Spray gun is used in dry process of garment washing plant. It’s needed during P.P spray. Spray dummy is needed in dry process of garment washing plant. During P.P spray it’s used. Screw compressor is an important equipment in garments washing plant. Laser draw is used in dry process of garments washing plant. It’s needed for producing laser effect in the garments.